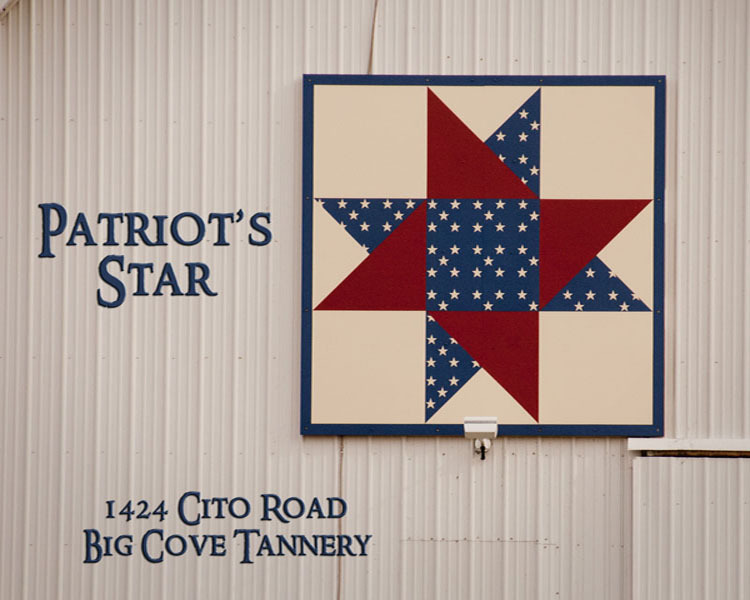 The Patriots Star Quilt is displayed at Big Cove Farm, 1424 Cito Road, Big Cove Tannery. David P. & Carol Morton Tebo purchased Big Cove Farm in July 2005 from Carols’ parents – Jack & Mary Jane Morton. The Morton’s purchased the farm in 1959 from Preston and Martha Mellott and the Mellott’s purchased it from Frank & Mary Johnston. This quilt design was selected because of the Tebo's service to the military. Dave served with the Army Reserve Program 1972 – 2002 at which time he retired as a Colonel from the Army Corps of Engineers. Carol worked with Family Support Programs at all of the units where Dave was assigned and/or led and served for 15 years as a Civilian with the Department of the Army. The Tebo’s retired in 2011 and returned to live at Big Cove Farm. This quilt was painted by David and it was the first one he had ever done. He enjoyed every minute of effort. The quilt was hung by Randy Bunch of Bunch Construction. An evening spot light has been added so this quilt can be enjoyed day or night. Every day the Tebo’s appreciate the opportunity they have been given to live in Fulton County and at this beautiful farm.